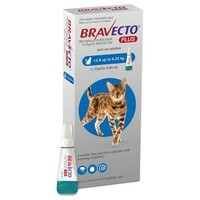 Bravecto Plus Spot-On for Medium Cats is for the treatment of mixed infestations with both ticks and other parasites that may be found on the skin or fur of cats, such as fleas, and/or worms that live inside the body. Bravecto Plus contains the active ingredients fluralaner and moxidectin which work in combination to kill parasites by interfering with their nervous system, causing paralysis and eventually death. Each 0.89ml pipette contains 250mg Fluralaner and 12.5mg Moxidectin. Suitable for Medium Cats weighing >2.8 – 6.25kg.